Robohub’s Andra Keay called it the second wave of social robots: on the heals of Pepper’s unveiling last month, July saw the launch of Cynthia Breazeal’s new start-up, “Jibo”, and Honda announced that its social robot Asimo has a new upgrade. The Jibo crowd funding campaign is now in full swing, having surpassed its initial target of $1 million within its first week. In an article about Jibo’s potential on Forbes, Ryan Calo even wondered whether Cynthia Breazeal could be the Steve Wozniak of robots. In other crowd funding news, July also saw the launch of Robohub’s Indiegogo partner page for robotics startups. Our first campaign, featuring Jerry the Bear, has already hit its crowdfunding target and is still going strong. We hope there will be many more crowdfunding success stories to come in the future. Watch this space! Launched in June, Robohub’s autonomous vehicle series has remained a hot topic this July. Brad Templeton outlined the two schools of thought on autonomous vehicles, explaining that companies like Google have elected an aggressive approach – essentially developing computers on wheels – while manufacturers of ‘old school’ cars are following a more conservative approach, integrating automation into existing vehicles. Whatever the approach, the cars of the future will surely be more autonomous than they are now. What do you think about autonomy? Robohub readers once again had their say in a poll about decision-making in autonomous cars, involving a scenario where an autonomous car must make a choice in colliding with a motor cyclist wearing a helmet versus one without. Despite the potential control afforded by autonomous systems to determine the outcome, readers paradoxically chose random chance over informed decision, perhaps reflecting on the difficulty in dealing with situations where autonomy meets law and ethics. Another recent poll in the UK showed that British drivers shun autonomous cars, citing reliability as their biggest concern. Clearly trust remains a big obstacle in their adoption. With the rise of social robots, and the ways in which robots are now being used to complete many of the mundane human jobs in various industries, the very definition of what constitutes a robot is constantly evolving. And with robots becoming increasingly prevalent, intelligent, and social, one can be forgiven for having ethical concerns as to their use, as was pointed out in the Slate article “Robots are people, too“. Yet while AI is definitely here to stay and developments in this field will continue, Alan Winfield argued that artificially evolving human-equivalent AI is unlikely. In his contribution to the book “Our work here is done – visions of a robot economy”, he closes with a section on what’s not coming soon: super intelligent robots. The contentious issue of robots taking over the jobs of humans once again received attention this July with a YouTube interview with one of the co-founders of Google about whether we should let robots take our jobs. Manufacturing jobs have long been on the list of those at risk of being taken over by robots, and this seems confirmed by the recent announcement by Chinese company Foxconn that it will use 10,000 robots to build the new iPhone6. It is perhaps a little more surprising that robot convoys may soon take the place of trucks on our roads, farmers will have robot help in the field, and even doctors may be replaced by virtual Physician Assistants. However, it’s not all doom and gloom on the job market. Various reports this July indicate that robots also create jobs, for instance, recent investments in robotics in general and drones in particular have led to the recruitment of thousands of new staff worldwide. Robots are becoming more and more popular in education, and a new wearable fashion toy is now teaching girls how to program. Another STEM start-up this month was the TiddlyBot, which can be programmed to draw harnessing the power of Rasberry Pi. July saw a third exoskeleton company, ReWalk Robotics, go public, after Ekso Bionics and Cyberdyne. There is a definite buzz around exoskeletons, with a recent Robots Podcast also covering this topic. Smaller bionics are also making the headlines, for instance with the hand from MIT that will give you super powers. But it’s not all about human hands. New sensors have also been developed that will give robot fingers an actual sense of touch. Given all the interest in drones this year, various stories about drones made it into the news once again this month. Among them was a request from internet giant Amazon seeking FAA approval for testing its 50mph delivery drones. As yet, there has been no response from the FAA, which is also expected to miss its 2015 deadline for UAS/NAS Integration. While the regulatory battle around drones is rages on, their potential has once again been proven as a family in Fitchburg used a drone to find a missing person. Also in July, Martha Stewart explained in Vanity Fair why she loves her drone. In research, students developed UAVs to support search and rescue efforts via wifi signals, and drones have now also been suggested as broadcasting devices. Whether these new ideas will be able to take off in the US, though, is up to the FAA. We are sure there will be more on this issue next month. There was sad news for the African drone community, as a delivery drone challenge for areas with little or no infrastructure in Arica – the Flying Donkey challenge – was cancelled this month as aviation authorities in Kenya decided that they could not go ahead due to security concerns following the Westgate Mall incident. In contrast, in the US, a University Aeronautics Engineering Design Challenge concerned with Hurricane trekking UAVs run by NASA announced its winners, giving the three winning teams the cash and support to take their ideas to the next step. 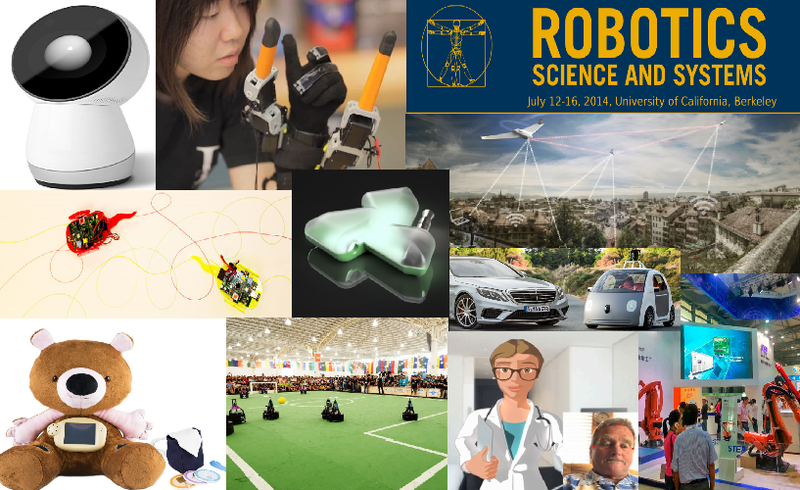 July saw an extremely successful Robotics Science and Systems conference (RSS) 2014, which showcased social, ethical and economic issues in robotics, and highlighted robotics start-up stories in some very well attended sessions. Robohub’s Andra Keay summarised the event in a two part report, focusing on the new start-ups and perspectives from the established robotics industry. The China International Robot Show was also a big hit this July with record numbers of exhibitors and visitors attending the event in Shanghai. Finally, we could not finish this month’s digest without at least mentioning that, just a few weeks after the Football World Cup, the RoboCup (also in Brazil) took over, with a team from the Netherlands taking first place. Congratulations to Eindhoven University of Technology for their 3-2 win against the University of Beijing!